Publisher: New York University Press, 1948. Reprint Edition, BeerBooks.com, 2006. Soft Cover, 451 pages, 6.25 x 9.25. In 1948, Thomas Childs Cochran, Professor of History at New York University, completed what is perhaps the most in-depth historical study of an American brewery ever undertaken. 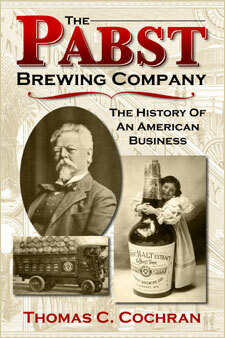 The result was The Pabst Brewing Company: The History of an American Business. During the book's preparation, the author was granted full access to the Pabst corporate archives, nearly all of which has since been lost or destroyed. Without Cochran's work, much of the Pabst story might have remained forever untold. To make this landmark study available to a wider audience, BeerBooks.com has reprinted Cochran's book from an original 1948 first edition. We've also added a multi-page photo section filled with images from the archives of the Captain Frederick Pabst Mansion in Milwaukee. The book's incredible depth of research offers unmatched insight into the ups and downs of a major American brewer, with a particularly strong focus on the period between 1873 when the brewery was first incorporated and 1919 when National Prohibition loomed. However, in chronicling the company's history, Cochran paints a picture that goes well beyond the Pabst saga, and provides a detailed glimpse into both the development and decline of America's "golden age" of brewing. The period from 1859 to early 1864, during which time Phillip ran the brewery alone, were years when no Milwaukee brewer could do more than cut expenses to the minimum and wait for better days. The sales of Best and Company declined from a level of 7,000 barrels, reported in the census of 1860, to 3,677 for 1863. The latter figure, however, is an exact amount based on tax returns, and is not strictly comparable to the 1860 figure that may have been set with an eye to favorable publicity. Meanwhile, Phillip's health was declining, and he wished to retire, but there was no one in the immediate family to take over the business. 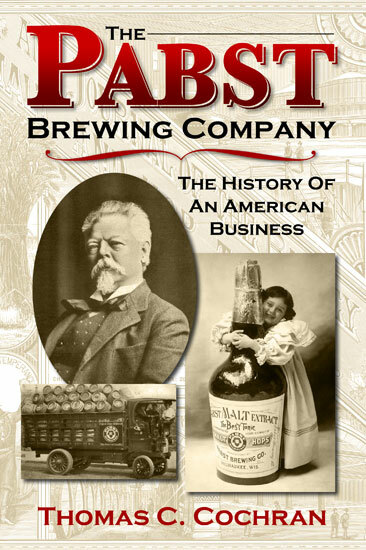 The solution to his problem came through the marriage of his daughter, Maria, to the man who was to provide, in brewing, the most brilliant leadership of his generation, Frederick Pabst. Frederick Pabst was the kind of man about whom legends gather, and in describing his early life a selection must be made of those stories best substantiated and most widely accepted. There is an unconfirmed report that the Pabsts were descended from a noble Dutchman, Paul Pabst von Ohorn, who established himself in Saxony in I470. Accounts generally agree that Frederick Pabst's father, Gottlieb, was foreman of a large estate at Nicholausreith in Thuringia where Frederick was born on March 28, 1836. Frederick's father and mother, Fredericka, came with their child to the United States in 1848, not apparently for political reasons but because friends had praised the opportunities in America and particularly in Milwaukee. The elder Pabst, however, found no opportunities to his liking in the Cream City and, having exhausted his savings, he and his family were forced to go to work in a boardinghouse in Chicago. The death of the mother in the cholera epidemic of 1849 ended their arrangements at the boardinghouse, and Gottlieb became a cook at the Mansion House where young Fred waited on tables for $5.00 a month and board. This was obviously no job to satisfy a boy with the spirit of Frederick Pabst, and, after two years, he gave up hotel work and took to the sea as cabin boy on one of the Goodrich Line steamers plying Lake Michigan. There is a widely repeated story, often told by Frederick Pabst himself, that illustrates his forcefulness and determination at this early age. As a cabin boy it was his job to collect the tickets of passengers as they left the ship. One day at Chicago, Captain Ward, one of the owners of the Line, tried to leave without a ticket and was stopped by Pabst. Refusing without proof to credit Ward's story regarding who he was -- Pabst had never seen him before -- he forced the disgruntled officer to return to his cabin and wait for proper identification. One of the interesting parts of the legend, revealing Pabst's personality, is that he did this in such a way that Captain Ward did not hold it against him later, but rather made it a reason for greater respect. By using his spare time to study navigation, and ordering pilots relief at the wheel, Pabst became a first mate on the Goodrich Line "Traveler" at the age of twenty. Soon after, he distinguished himself by rescuing the captain and several passengers from the burning steamer, "Niagara." He used his spare time the next winter to take a course in bookkeeping that must ultimately have been of great value to his business career. In 1857, he was made captain of the Goodrich steamer "Huron." As it was customary with the Line to have captains own a share in their ship, Pabst became a part owner at one time or another in several of the Goodrich Line's vessels, and ended as a shareholder in their newest and finest ship, "The Seabird." Phillip Best liked to travel by boat, and was frequently on Captain Pabst's ships. In 1860 the twenty-four-year-old Captain met Phillip's fifteen-year-old daughter, Maria, either by fishing her out of the water when she fell off a gangplank when boarding his ship, "The Comet," or in the more prosaic fashion of being invited to the Best's home in Milwaukee. On March 25, 1862, they were married. After this, when he was not on the lake, the Captain lived with the Bests. In 1863 he was elected a Second Ward alderman,13 proof not only of Phillip Best's standing in the community, but also, and more important, of young Pabst's winning personality. Because of the demands of increasing business and Phillip Best's wish to retire, home ties undoubtedly would have drawn the Captain into brewing in a few years in any case. This decision was hastened, however, by a shipwreck, which undoubtedly made it easier for him to quit the sea. Caught too near the shore in December of 1863 by one of the sudden storms which are so frequent on Lake Michigan, he skillfully beached "The Seabird" on the sands of Whitefish Bay without casualties. As the vessel was not moved until mid-July, and the repairs cost approximately $20,000, the Captain undoubtedly had to pay over most of his share in her to the Goodrich Line. Whether he had anything left to invest in the brewing business is impossible to tell, but, in any case, the business needed managerial help as much as additional capital and Phillip seems to have been glad to take him in as an equal partner at the beginning of 1864. The marriage of Phillip's younger daughter, Elizabetha, or "Lisette," to Emil Schandein on May I6, 1866, added the other member of the team that was to run the business so brilliantly for the next twenty years. Schandein, who had attended a scientific and technical school in Germany, contributed knowledge that Frederick Pabst lacked, and he shared with the Captain the ability to make friends and to command the respect of the community. Phillip Best now felt able to indulge in his wish to retire from business. On October 15, 1866, the partnership between Best and Pabst was dissolved by Phillip Best, paying Frederick Pabst $21,057.95 for his share in the business. Then a new agreement was entered into whereby Pabst and Schandein each paid Best $21,057.95 for a half interest, $6,057.95 down, and the remaining $15,000 in quarterly installments over six years. This sale did not include any of the brewery property or buildings, but merely the business itself and the movable equipment used in it. For the use of the property, Pabst and Schandein were to pay Best $4,800 per year. These figures would indicate that the value of the entire business, including property and equipment, was by then, due largely to the general advance in prices, probably $100,000.